A common UI element in Android applications is an animated panel that provides access to certain actions. A panel like this should only be shown temporarily, perhaps triggered by other UI state changes initiated by the user. 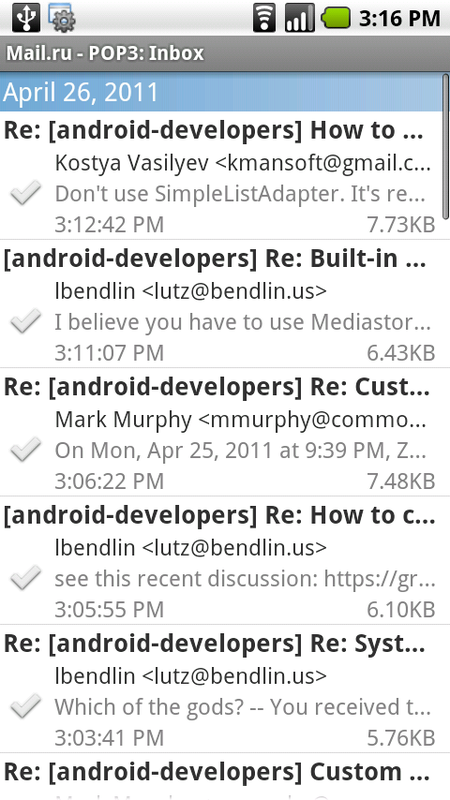 You can see an example of this in GMail application: when you select one or more messages, a panel slides up from the bottom with buttons to act on those selected messages. While using a PopupWindow is cetainly an option for this, it can be quite convenent to define the panel as a view group within the activity’s layout. With a unified layout, the activity can obtain a reference to the panel’s view group with findViewById, and change its visibility state with View.setVisibility, either to View.VISIBLE or View.GONE. 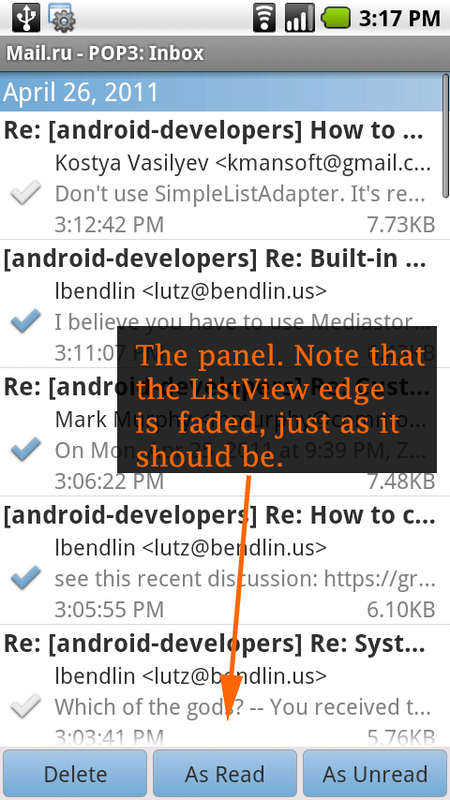 Just changing the panel’s visibility isn’t by itself animated, especially when going from VISBLE to GONE: view animations are only shown if the view is visible. When hiding the panel, it’s necessary to first run the “slide out” animation, and only then set the visibility to GONE. So – here is a simple class that makes it very easy to implement animated panels. It is constructed with a reference to the panel’s parent ViewGroup, and the type of animation (from right / from bottom), and has methods to animate the panel to slide in / out. The class keeps track of the panel’s state, including currently running animations. When requested to hide the panel, it runs a “hide” animation first, and when the animation completes, but not sooner, changes the panel’s visibility to View.GONE. This class uses two animations defined as resources, used when the panel is positioned at the bottom. When the panel is on the right, this class uses standard Android animations (also used for activity animations).